Free digital training for start-ups will be on offer again as the Google Digital Garage bus returns to Rotherham. 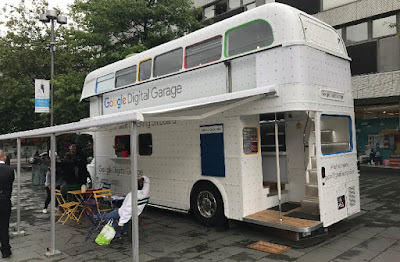 As part of its Google's Digital Garage initiative, the bus is stopping at over 30 locations to offer free workshops and face-to-face coaching on anything from websites to online marketing and beyond. The bus will be parked up outside Rotherham Council's Riverside House in the town centre on Monday December 4. It is also set to return to Effingham Street outside Halifax and Boots on December 14 and 15. Google's Digital Garage is temporarily based in the former Early Learning Centre building in Pinstone Street in Sheffield city centre. The tech giant's first high street store is the venue for a range of digital skills courses. Attendees can learn the vital skills needed to succeed in the digital age, from how to develop their web presence, grow their business or charities online, improve their career prospects or just build their confidence by using online tools for the first time. On Monday, businesses can take advantage of the Introduction to Digital Advertising course to learn about search, social and display advertising and how to get started with advertising a business. Further workshop session for small businesses are scheduled for later in the month. Google workshops include topics such as "Get Your Business Visible on Google," "Social Media Strategy" and "Build a Digital Marketing Plan." One to one coaching is also avaialable and the tech giant also runs a five-week course ideal for anyone dreaming of starting their own business. Cllr. Chris Read, Leader of Rotherham Council, said: "The Google Digital Garage Bus visiting Rotherham is a fantastic opportunity for residents to gain new skills and knowledge, whether they're just starting out online or want to make sure they and their family are safe online. It’s also a great benefit for local businesses to see how they can reach more customers and increase their business potential. "The Council is pleased to be able to offer this training in partnership with a world-renowned organisation, making sure residents and businesses get relevant, top advice." Alice Mansergh, director of Google Marketing Solutions for UK and Ireland, added: "Google's products and free digital training are a growth engine for people and businesses up and down the country. So if you live in the South Yorkshire region and you want to boost your career, or turbocharge your business, please join us at our Digital Garage bus and talk to our experts. We can help you connect to new customers, help boost your productivity or improve your employability no matter what field you work in."